Wlodzimierz Cimoszewicz, the former prime minister of Poland, will speak at Wake Forest University on Monday, Nov. 23. Cimoszewicz’ talk, “The Transition of Poland: From 1990 to 1998,” will focus on Poland’s transition from communist rule. The talk, which is free and open to the public, will begin at 3:30 p.m. in Tribble Hall, Room C316. In addition to serving as prime minister from 1996-97, Cimoszewicz held a number of governmental positions including deputy speaker of parliament, minister of justice, attorney general and deputy prime minister. As chairman of the National Assembly’s Constitutional Committee, Cimoszewicz was instrumental in rewriting Poland’s constitution. Cimoszewicz belonged to the Polish United Workers Party (PUWP) from 1971 until 1990. Since then, Cimoszewicz has remained independent. Before entering politics, Cimoszewicz, who has a doctorate in international public law, taught at Warsaw University and worked as a farmer. Cimoszewicz is visiting Wake Forest during the Year of Globalization and Diversity, the university’s yearlong look at the world’s development into a more global community. 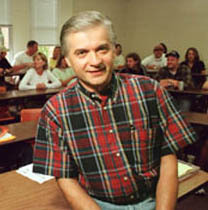 Cimoszewicz is in the United States lecturing at Appalachian State University during the fall semester.